We're getting really excited about our new Standard League. It's starts Tuesday! Don't worry! You can have a substitute play for you that week and have it still count toward your league totals. We'd love it if you can make every session, but we understand that your schedule is busy! 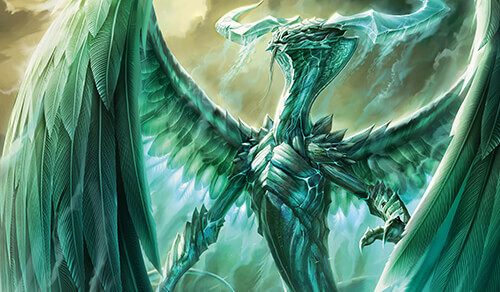 We've decided to go big and award Ugin, the Spirit Dragon to anyone who goes undefeated in any week! If you can run the table and go undefeated throughout the whole ROUND ROBIN portion of the League, we'll award a Promo, Ugin, the Spirit Dragon to you! While we expect this League to be very competitive, we are also all working together. The round robin portion of the League will cover 120 matches, and we'll have a ton of data to look at. By virtue of playing in this event, you'll be pooling a lot of collective effort that we can use to aggregate and learn more about this Standard environment. I will be judging these events and look forward to observing matches. After sessions are done, I will be talking to everyone about lines of play, card choices and matchups you've been facing. If your goal is to get better at Magic, I sincerely believe that, every person entering this League will have learned something new when it's all said and done!